At South Family Dental Care, our Dental Hygiene team is here to exceed your expectations by providing our patients with a relaxing dental hygiene experience. Our Dental Hygienists also educate our patients on the importance of dental & oral health to learn how to maintain healthy teeth and gums between appointments. When you visit South Family Dental Care for your South Calgary Dental Hygiene Therapy, our team of dental hygienists will clean your teeth both above the gum line, which is known as scaling and below the gum-line, using a technique called root planing. We use both traditional hand scalers and our ultrasonic scaling tools to remove calcium deposits, called calculus, from your teeth. Your Dental Hygiene Therapy also includes an examination by Dr. Angela Sharma to evaluate the current health of your teeth, gums, and the surrounding tissue. 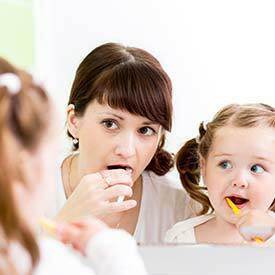 Your hygiene therapy needs depend on several factors. If your teeth are more susceptible to the accumulation of plaque and calculus, if you have crowded teeth, or if you have advanced gum disease, the frequency of your visits may not match the other members of your family. Our dental team evaluates every patient on an individual basis to determine the dental hygiene schedule that will best meet the specific needs of our patients. Most patients visit South Family Dental Care for their dental hygiene appointments every 6 months, but some people may benefit with a hygiene visit every 3-4 months. 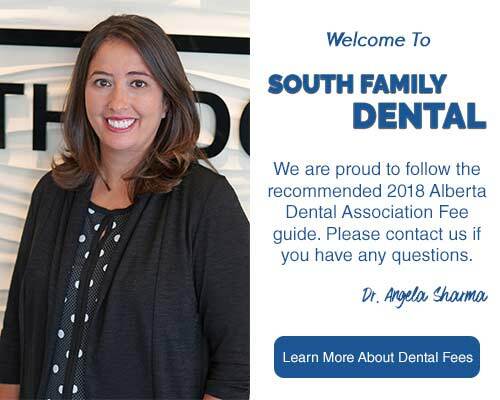 The dental hygienists at South Family Dental Care will advise you on how often you should visit our South Calgary dental practice to maintain your oral health and wellness. If maintaining the health of your teeth and gums for a lifetime of dental wellness is important to you, our South Calgary Dental Hygiene Therapy will help you achieve your goal for optimum dental health. Call us at (403) 262-3235 to book your Dental Hygiene Appointment us today!